In my relentless quest to acquire every possible tool before I leave this planet, this weekend I picked up a leaf vacuum. Thanks to my neighbor's regrettable decision to plant a bunch of poplars in his yard, all of which grew to over 60 feet in a few short years, my back yard maintenance has increased several-fold, especially this time of year. If you have any experience with poplars you know that they shed like sheepdogs. It was all the excuse I needed to invest in a new electric tool. No more acoustic brooms for me! Lowes carried Black & Decker, Toro and Troy-Bilt. They were all 12 amps, all fairly heavy, all injection molded plastic and they're probably all made in the same Chinese factory. So I looked for details on the box to close the sale. The B&D had a "metal impeller". I wasn't sure what difference that made, but it was ten bucks more than the others so it had to be better, right? 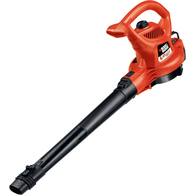 I wanted to write a review of the Black & Decker but it died on me five minutes into its maiden voyage. The motor started making a clicking noise, slowed down, started smoking... I took that as a clue. I've never had much luck with Black & Decker, from the toaster oven that caught fire to the power screwdriver than came apart in my hand. Okay, their stuff is pure crap. I mostly acquire B&D junk only by way of well-meaning gift givers. Folks, I have no product advertisers here for a reason. Lowes took the return in good spirit. The nice lady at the return desk said, "Another one, huh?" I thought she was asking if I wanted to replace it, which I didn't. Instead, without looking up she pointed at the wall where there were two more expired B&D leaf vacs. Read more about Found my orginal C of O!